The Magpie Salute, which includes three former members of The Black Crowes, will open all six concerts. Dark Side of the Mule is an elaborate Pink Floyd tribute show (and a 2014 live album) filled with Floyd’s band’s most iconic songs, along with a stunning light show, and various guest musicians. In late August, the three acts have a trio of shows planned for the Midwest. The August portion of the tour starts at Ruoff Home Mortgage Music Center in Noblesville, Indiana on August 23. 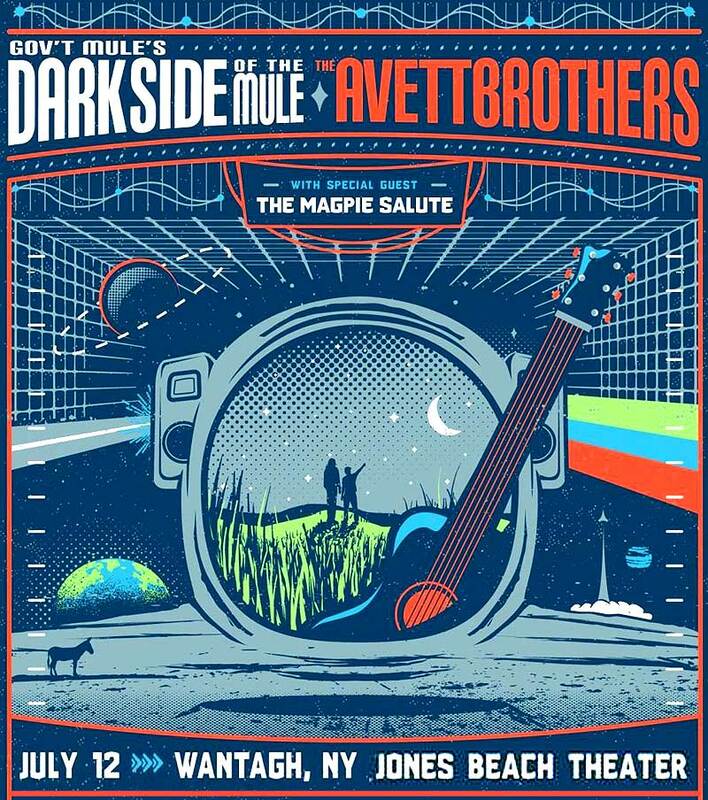 From there, the run is currently set to conclude with concerts in Tinley Park, Illinois on August 24 and Clarkston, Michigan on August 25... Gov’t Mule has only played two prior Dark Side Of The Mule tributes to Pink Floyd. The first was their Mule-O-Ween show on Halloween 2008 in Boston and the other was at the 2015 Mountain Jam Festival. Mule will also present Dark Side Of The Mule at this summer’s Peach Music Festival in Scranton. Look for “several special guest musicians” to help the quartet present their Floyd tributes. The Avett Brothers /ˈeɪvɪt/ are an American folk rock band from Concord, North Carolina. The band is made up of two brothers, Scott Avett (banjo, lead vocals, guitar, piano, kick-drum) and Seth Avett (guitar, lead vocals, piano, hi-hat) along with Bob Crawford (double bass, electric bass, violin, backing vocals) and Joe Kwon (cello, backing vocals). Mike Marsh (drums) and Tania Elizabeth (violin, backing vocals) are touring members of the band.. Following on from Seth and Scott's former rock band Nemo, The Avett Brothers combine bluegrass, country, punk, pop melodies, folk, rock and roll, indie rock, honky tonk, and ragtime to produce a novel sound described by the San Francisco Chronicle as having the "heavy sadness of Townes Van Zandt, the light pop concision of Buddy Holly, the tuneful jangle of the Beatles, the raw energy of the Ramones." .. The Magpie Salute is an American rock band formed in 2016 by former Black Crowes guitarist Rich Robinson. The band also includes former Black Crowes members Marc Ford and Sven Pipien as well as Rich Robinson band members Matt Slocum, Joe Magistro, Adrien Reju and Katrine Ottosen.